You’ve heard the stories of people making an incredible amount of money online. Sometimes it’s a little hard to believe. But the stories are true. When you investigated further, you were amazed to discover these weren’t the online versions of Donald Trump. Usually, these folks who’re pulling in all this cash are just regular people. People just like you and me. Average folks. Then it hits you – you can do this too. You can make money online too. And all you have to do is create a simple ebook and start selling it on Clickbank. So far so good. But here’s where the wheels come off the money-making bus for most people. Because you hear so much about making money with ebooks, aspiring online marketers often start working on their ebooks immediately. Eventually they finish the ebook, create a sales page and start driving traffic to their site – at which point they get an unpleasant surprise. No one wants to buy the product. And so they don’t make a dime. Worse yet, all the time and money already poured into the venture are completely wasted. Here’s the secret to finding out what people want: Simply find out what they’re ALREADY buying! You see, you don’t need to reinvent the wheel. You shouldn’t guess. And you shouldn’t try to force products on people that you think they “need” (because if they don’t also want these products, you’ll go broke trying to convince people to buy them). Step 1: Go to Clickbank.com and view the marketplace. Either browse the categories or use their search function to search for niche products. Those products at the top of the search results and categories are the bestsellers. Step 2: Visit Amazon.com. Next, go to Amazon and run a search for your market keywords (like “copywriting” or “making candles”). Those books appearing at the top of the search results are the most popular products in the niche. Step 3: Run a quick search in Google. Finally, enter those same keywords into Google and see what pops up in the regular search results as well as the sponsored results. What are the top sites in your niche selling? Once you complete these three simple steps, you’ll know exactly what your market is already buying. And then all you have to do is make a similar – but better – product! You do that by studying the competition, finding the flaws in their products, and making sure your product doesn’t include those same flaws. TIP: You find out a product’s flaws simply by reading and using the product for yourself. But you can also search online for product reviews (check Amazon for starters). If you see customers repeatedly mentioning a weakness of the product, then you’ll instantly know how to create a better product. Now that you know what your market wants, what’s the next step? 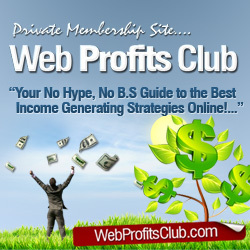 Simple: Claim a free Silver Membership at Web Profits Club (normally $27.00) – Just Use This Special Link For Access. Inside you will to discover six proven ways to profit from this hungry market – you’re about to be pleasantly surprised!